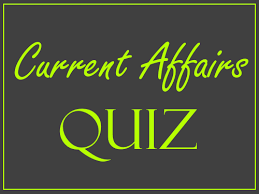 Current affair quizzes provided in this article, are very important for IAS Prelims Exam preparation. It is important to practice current affairs quiz based on the recent events. In IAS Prelims Exam 2017, there is a greater chance of asking such questions of the same pattern. Now, current affair has become one of the important sections of the upsc Exam. To study current affairs for UPSC Prelims Exam and UPSC Mains Exam requires a sincere and continuous practice on daily basis from as IAS aspirant. Here, in this article we have provided current affairs quizzes based on the events happened in the month of February, 2017. I. The objective of Act East Policy includes deepening of economic cooperation and expanding trade with countries in the Asia-Pacific Region and the process facilitates bilateral trade from North-East also. III. Total estimated trade (as provided by Department of Revenue) between India and Myanmar through the North-East has grown from Rs. 7752.72 lakhs to Rs. 14452.26 lakhs between 2013-14 and 2015-16. The major objective of Act East Policy includes deepening of economic cooperation and expanding trade with countries in the Asia-Pacific region. The process facilitates bilateral trade from North-East also. Total estimated trade (as provided by Department of Revenue) between India and Myanmar through the North-East has grown from Rs. 7752.72 lakhs to Rs. 14452.26 lakhs between 2013-14 and 2015-16. • Improving the land connectivity on Indian side through widening of the Imphal – Moreh road. • Initiation of better banking facility. I. The Bay of Bengal Initiative for Multi-Sectoral Technical and Economic Cooperation (BIMSTEC) is a regional organization comprising seven Member States namely Bangladesh, Bhutan, India, Nepal, Sri Lanka, Myanmar and Thailand. II. The objective of building such an alliance was to harness shared and accelerated growth through mutual cooperation in different areas of common interests by utilizing regional resources and geographical advantages. The BIMSTEC- Bay of Bengal Initiative for Multi-Sectoral Technical and Economic Cooperation is a regional organisation comprising seven member states such as Bangladesh, Bhutan, India, Nepal, Sri Lanka, Myanmar and Thailand. The regional block acts as a bridge between South and South East Asia and represents a reinforcement of relations among these countries. The major objective of building such an alliance was to harness shared and accelerated growth through mutual cooperation in different areas of common interests by utilizing regional resources and geographical advantages. Unlike many other regional groupings, BIMSTEC is a sector-driven cooperative organization. Starting with six sectors—including trade, technology, energy, transport, tourism and fisheries—for sectoral cooperation in the late 1997, it expanded to embrace nine more sectors—including agriculture, public health, poverty alleviation, counter-terrorism, environment, culture, people to people contact and climate change—in 2008. I. Rashtriya Uchchatar Shiksha Abhiyan (RUSA) is a Centrally Sponsored Scheme (CSS), launched in 2013 aims at providing strategic funding to eligible state higher educational institutions. II. The central funding (in the ratio of 60:40 for general category States, 90:10 for special category states and 100% for union territories) would be norm based and outcome dependent. III. It has the objective to improve the overall quality of state institutions by ensuring conformity to prescribed norms and standards and adopt accreditation as a mandatory quality assurance framework. In the centrally sponsored scheme of Rashtriya Uchchatar Shiksha Abhiyan (RUSA), the National Remote Sensing Centre (NRSC) of Indian Space Research Organisation (ISRO) has developed a mobile application for uploading geo-tagged photographs and associated details captured by the educational institutions, on Bhuvan-RUSA portal as a part of implementation of RUSA funded works in States. This application for geo-tagging of institutions under RUSA is a location based service. I. All children aged between 9 months and less than 15 years will be given a single shot of Measles-Rubella (MR) vaccination. II. Measles-Rubella (MR) vaccination can only be provided if no vaccine relative to measles/rubella has ever been given to the child. III. Measles vaccine is currently provided under Universal Immunization Programme (UIP). The Ministry of Health and Family Welfare has launched Measles Rubella (MR) vaccination campaign in the country. The campaign against these two diseases will start from five States/UTs (Karnataka, Tamil Nadu, Puducherry, Goa and Lakshadweep) covering nearly 3.6 crore target children. Following the campaign, Measles-Rubella vaccine will be introduced in routine immunization, replacing the currently given two doses of measles vaccine, at 9-12 months and 16-24 months of age. The MR campaign targets around 41 crore children across the country, the largest ever in any campaign. All children aged between 9 months and less than 15 years will be given a single shot of Measles-Rubella (MR) vaccination irrespective of their previous measles/rubella vaccination status or measles/rubella disease status. MR vaccine will be provided free- of- cost across the states from session sites at schools as well as health facilities and outreach session sites. Measles vaccine is currently provided under Universal Immunization Programme (UIP). However, rubella vaccine will be a new addition. Measles is a deadly disease and one of the important causes of death in children. It is highly contagious and spreads through coughing and sneezing of an infected person. Globally, in 2015, measles killed an estimated 1, 34,200 children—mostly under-5 years. In India, it killed an estimated 49,200 children. Rubella is generally a mild infection, but has serious consequences if infection occurs in pregnant women, causing congenital rubella syndrome (CRS), which is a cause of public health concern. I. The Telecom Regulatory Authority of India (TRAI) was established by the Telecom Regulatory Authority of India Act of 1997. II. The Telecom Regulatory Authority of India (TRAI) was established to regulate telecom services, including fixation/revision of tariffs for telecom services. III. The Telecommunications Dispute Settlement and Appellate Tribunal (TDSAT) were set up to adjudicate any dispute and to hear and dispose of appeals against any direction of TRAI. TRAI's mission is to create and nurture conditions for growth of telecommunications in the country in a manner and at a pace which will enable India to play a leading role in emerging global information society. One of the main objectives of TRAI is to provide a fair and transparent policy environment which promotes a level playing field and facilitates fair competition. The TRAI Act was amended by an ordinance, effective from 24 January 2000, establishing a Telecommunications Dispute Settlement and Appellate Tribunal (TDSAT) to take over the adjudicatory and disputes functions from TRAI. TDSAT was set up to adjudicate any dispute between a licensor and a licensee, between two or more service providers, between a service provider and a group of consumers, and to hear and dispose of appeals against any direction, decision or order of TRAI.